Many pet owners have questions about how to best take care of their dog during the end of summer. Do not worry! 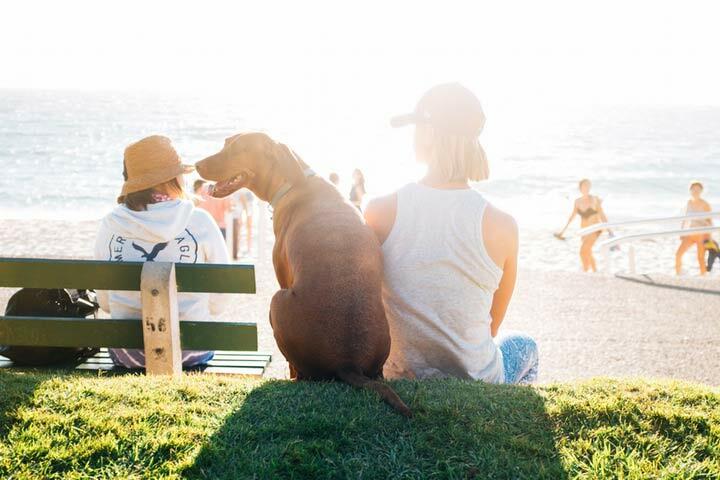 We have all the tips and tricks you’ll need to make sure your furry friend is healthy and happy while you’re out having fun in the sun! Now that we are in the dog days of summer, taking care of your dog can get a little hairy—literally! Many breeds shed more heavily in the months leading up to and throughout late summer. In anticipation of this, purchase a brush to start collecting the winter coat as it sheds before your pet leaves it all over your couch, car, or other beloved surface. Most dogs appreciate the pampering and they will immediately feel more comfortable in the hot sun! In addition to brushing them, help them beat the heat by getting them groomed before the heat gets too intense. Some breeds should not have too drastic of a shift during the season change, so ask your veterinarian what would be best for your specific pet. It is important to remember that you have a different wardrobe for the humid close of the summer than you do the winter. Your dog should have the same options. Many pet owners choose to use harnesses that go around the body instead of collars to attach leashes. These harnesses can have options where they come in heavy straps for the winter and also “barely there” straps for the summer. You can even purchase cooling wraps for different areas of the body if your dog gets extra hot! If the route that your dog walks on often has a lot of pavement (which can get hot! ), consider summer booties for sensitive paws. Supply Water For Dogs, Water Everywhere! Just like us, dogs need more water, especially late in the summer. Make sure you are constantly refilling your pet’s water bowl, or consider an automatic filling bowl. On particularly hot days, you can try adding an ice cube or two to your dog’s water. Cold water is not an issue for dogs to ingest, but too much water can be a problem. Ice cubes can actually help slow your dog down from drinking too much, too quickly. If you think your dog might be drinking too much water, ask your veterinarian what a good amount would be for your pet’s size and age so you can help moderate water intake. Speaking of water, kiddie pools are great for doggies too! We highly recommend considering this option if your pet will be spending a good amount of time outside during the summer. If you decide to leave the pool out for the remainder of the summer, remember to change the water daily for a number of reasons—it will be fresher for your dog if he or she decides to take a sip from the pool, and it will remove the standing water which is a haven for mosquitoes. Also consider changing up what type of treats you are giving your pet in the summertime. A really easy trick is to make broth popsicles using an ice tray the exact same way you would freeze juice into cubes for a cool treat. You can also find frozen treats at pet supply stores to give your dog a gourmet brain freeze! If your house does not have air conditioning, set up sturdy fans around strategic areas like dog beds, food and drink bowls, and anywhere else your pet frequents to make sure your they are comfortable. Some dogs can get a little worried around fans, so let your pet get to know the appliance by spending some time with them when you first set it up. Standing tower fans are great because they are difficult to knock over and are often very quiet which dogs tend to prefer. Beating the heat toward the end of the summer can be a breeze if you prepare accordingly! In addition to these precautions, always remain vigilant while you are with your pet outside. As the days get warmer, dogs spend more time outside and that means more potentiality for accidents. Many vets will tell you that summer is their “busy season.” Always keep a close eye on your pet to make sure to prevent anything dangerous from occurring! Also, as dogs spend more time outside during the summer, consider getting your dog a pet microchip with your information if you have not yet – just in case your dog gets separated and located by another party. Barring that, always remember to adorn your pet with the proper tags and information. Finally, remember—if you are hot, your dog is hot! Keep water with you at all times for your dog to drink, and also to pour on their feet, nose, and even belly to cool them off. Staying in the shade as much as possible also prevents both you and your dog from overheating and skin damage from the sun. Remember that every breed is different – your veterinarian will almost certainly have special instructions for your dog during the late summer season. Never hesitate to ask questions if you have them and you will be prepared with all the knowledge you need to keep your dog safe for the summer!